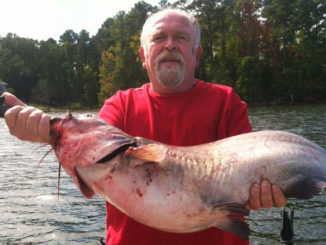 SCDNR biologists are happy to use your Christmas trees to build fish-holding structure. Christmas is over, and odds are that you’ll spend the rest of this week undecorating your home – removing the tinsel, putting the ornaments in storage and removing the wreaths from the doors and windows. As for the Christmas tree you hand-picked this year, whether it be a Virginia Pine or a Leyland cypress, there is a way to repurpose it instead of letting it take up space at a landfill. Discarded trees can be put to good use for fish or wildlife, like for erosion control or as brush piles to provide resting and cover for small animals. In addition to benefiting small game such as quail and rabbits, brush piles constructed of Christmas trees can help birds such as sparrows, towhees and wrens. 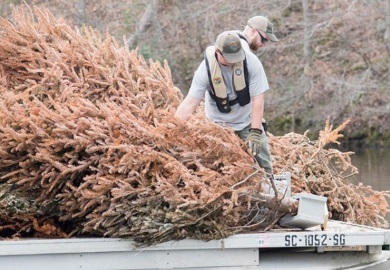 Fisheries biologists with the South Carolina Department of Natural Resources (SCDNR) use discarded Christmas trees to maintain fish attractor sites and act as natural reefs for freshwater fish. These sites are located at all major reservoirs in South Carolina, such as Lake Moultrie and Lake Marion. Once the tree is sunk, aquatic insects will live and grow within the branches and needles. These insects act as an attractant to small fish which are fed upon by larger fish. Please do not toss discarded trees at marked state fish attraction areas. While repurposing trees are great for the environment, it’s important to let SCDNR biologists chose which trees should go where so each area gets trees best suited for its needs. SCDNR has opened a tree drop-off area in Berkeley County in Bonneau until Jan. 10, 2019. That address is 305 Black Oak Road. Another alternative is grinding up your tree to use as mulch. Some cities and counties offer tree grinding at no charge after the holidays. Those who choose to take their mulch home can use it for flowerbeds, gardens or around trees and shrubs. Perhaps the best kind of recycling is to buy a live tree and replant it, and then the tree can provide evergreen cover for wildlife year-round. Consumers should keep in mind, however, that many kinds of popular Christmas trees will not survive the hot and humid South Carolina summers. Among the species that will likely live and prosper here are: Virginia pine, Scotch pine, sand pine, spruce pine, Eastern red cedar, white cedar, Leyland cypress and white pine, which does best in the mountains and upper Piedmont. Two varieties of Arizona smooth cypress developed in South Carolina, Clemson Greenspire and Carolina Sapphire, will also grow well in our climate. Tree species that may not survive here, except in our foothills and mountains, include hemlock, Colorado blue spruce, Douglas fir, Fraser fir and balsam fir.